Sat in the heart of the Maltese north region lies one of Malta’s most iconic physical landmarks, the imposing Rotunda of Mosta – a beautiful neoclassical Church that exemplifies the island’s rich Roman Catholic heritage and is demanding of your earnest attention as it dominates the skyline of the small, seemingly unassuming town whose name it adorns. Built between the 1830s and 1860s, the church was created to the designs of the Maltese architect Giorgio Grognet de Vassé. A former member of the Jacobin Society, Grognet joined the French expeditionary force as an officer during its Egyptian campaign at the turn of the 19th Century, before returning to Malta to pursue a career in the field of architecture. Grognet, who studied at Frascati in the Papal States, called upon his extensive knowledge of antiquities when designing the cathedral and it is widely regarded as the defining design of his career. In light of his endeavours, Grognet received an annual pension of £100 from Governor Le Marchant but died soon after the completion of the work in late 1862. Dedicated to the Assumption of Mary, the rotunda was commissioned out of a necessity to replace the pre-existing renaissance church built in around 1614 to designs of Tommaso Dingli that no longer held the capacity to serve the needs of the growing Mosta community. "The most magnificent, extensive and solid modern building in Malta"
The Rotunda of Mosta is designed in the image of the world-famous Roman temple the Pantheon – a decision that drew consternation from some members of the church, who took umbrage at the thought of a house of God being inspired by a building dedicated to the worship of Mars, the Roman god of war. Despite initial objections to the controversial design concept, evidence that public opinion had begun to turn in favour of the architectural phenomenon is well-documented as the building moved from conceptual design to real-world structure. As Thomas MacGill’s 1839 book A Hand Book, Or Guide, for Strangers Visiting Malta proclaimed to rotunda to be "certainly the most magnificent, extensive and solid modern building [in Malta]". MacGill further expressed his admiration for Grognet’s bold designs, stating "when finished, [the church] will be an ornament to the Island, will immortalise the architect, and draw towards the casal every visitor to Malta." And MacGill’s bold predictions have stood the test of time, with the cathedral becoming a staple for many of the intrepid explorers to this Mediterranean land. As one approaches the steps to the rotunda, evidence of the inspiration that has been absorbed from Rome’s Pantheon is emanated by the building’s elaborate façade, which boasts a portico of intricate decoration that is supported by six ionic columns and flanked by two charming bell towers. The exterior is also adorned with meticulously crafted statues built in the image of many patron saints of the Christian faith. The external design of the rotunda is a magnificent sight to behold and the numerous surrounding cafés allow you to relax with a refreshment as you take in the views of one of Malta’s most splendid architectural feats. "In a nation for which Baroque design dominates much of the cityscapes, the Rotunda of Mosta carries the torch for its neoclassical contemporary"
The church boasts the third largest unsupported dome structure in the world, the interior of which is adorned with a decorative fresco depicting Biblical events and is particularly ornate, even by the high standards set by Maltese churches. The interior contains eight niches displaying holy statues and other relics, including a deep apse that holds the main altar alongside a further statue depicting Christ Carrying the Cross. Standing within the tranquillity of the rotunda gives one an immense sense of inspiration. The building is a credit to neoclassical architecture and is an outstanding monument to Malta’s long-standing and deep-rooted commitment to the Christian faith. Indeed, the church still holds multiple daily services for the community. Interested in Maltese architecture? Learn more here! "One of Malta’s greatest architectural jewels"
Perhaps the most famous moment to have occurred in the church’s 150 year history is the notoriety it gained in the Second World War, when a Luftwaffe bombing raid saw it hit by three munition shells on 9th April 1942. Of the three shells targeted at the church, two deflected off the building whilst the third pierced the rotunda’s roof. A congregation of 300 people were inside the church at the time of the bombing, however, the shell failed to detonate – sparing the lives of all of the worshippers that were occupying the building at the time. 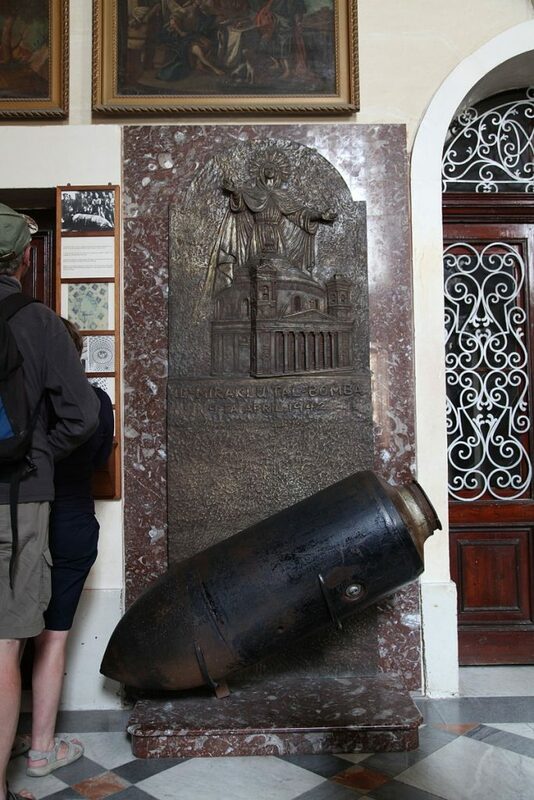 The incident was declared to be a miraculous occurrence by the people of Mosta and a monument, including a replica of the aforementioned shell, was erected in homage to this moment of divine intervention and is still on display at the back of the church to this day. 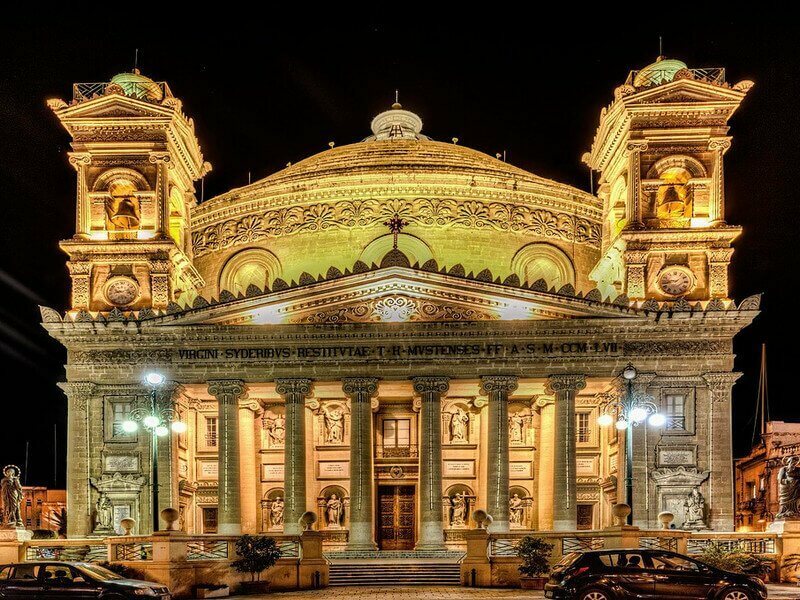 The Rotunda of Mosta is undoubtedly one of Malta’s greatest architectural jewels. In a nation for which Baroque design dominates much of the cityscapes, the rotunda carries the torch for its neoclassical contemporary. Check out the Rotunda of Mosta first hand with this great video!